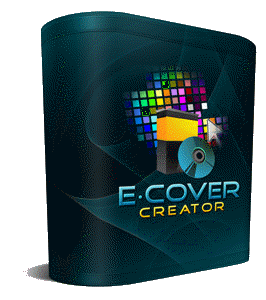 3d Ecover Creator Pro to make 3d boxes, books, ecovers, discs and pamphlets Graphic art tool to make your products or services stand out. 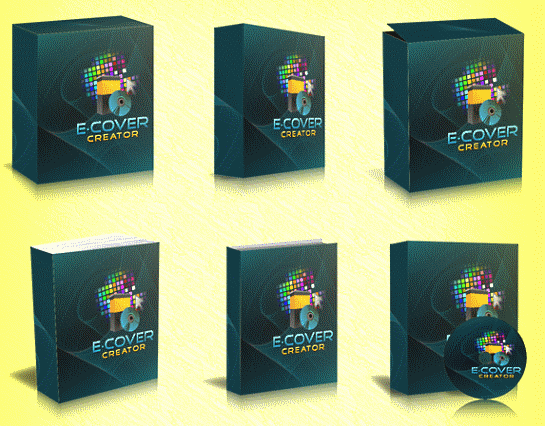 3d Ecover Creator Pro to create amazing 3d eCovers directly from your PC In under 3 minutes. 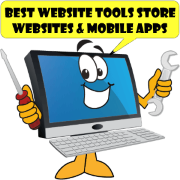 With just a few mouse clicks, you can skyrocket your product sales by as much as 72%. Beauty sells. You can too. In a world where everyone is obsessed by self image, looks matter. And yes, people really do judge a book by it's cover This software will quickly and easily transform your images into 3d ecovers that could make your products look like a million bucks! 3d boxes get attention. Strategically placed ecovers give your reader no choice but to look at them. Show off your products with great artwork. Turn undecided lookers into paying customers who trust you because your product looks great. Re: Making Amazing 3d ECovers in under 3 minutes! 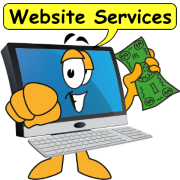 You work very hard day in and day out to get traffic to your site, only to have your visitor leave because your website looks "junky and unprofessional!" The truth is, nobody wants to buy trash! That's exactly what's in the visitors mind when they see your precious e-product, but it doesn't have a professional eCover representing your 'fabulous' product. You just might have the best product in the world, and know it. But, if your presentation looks mediocre, then your product may be perceived as mediocre too, right? It's simple in-built psychological association that people have. Good looks mean good things. Great looks mean great things. I'm a movie buff and I watch a lot of movies. I see so many that I now get selective as to which ones I will watch and own on DVD. So to filter down and decide which one I will pick as I skim through the movie covers. "A person's physical attractiveness -- the look that they're basically born with -- impacts every individual literally from birth to death" says Dr. Gordon Patzer, dean of the College of Business Administration at Roosevelt University. He's spent 30 years studying and writing about physical attractiveness. "People are valued more who are higher in physical attractiveness. As distasteful at that might be, that's the reality." That statement flows over to other things in life that are good looking. People will give good looking things their preference and their time. Attractive, professional eCovers will catch the interest of your audience, no doubt about it. 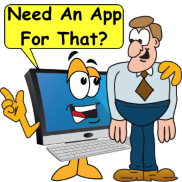 Don't have big money to spend on expensive software or graphic artists? 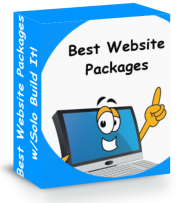 No worry this low cost software is yours to keep forever. Don't have a creative bone in your body? Well don't worry because the tutorial shows you how to be creative. 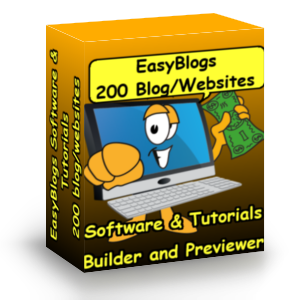 Take a look at all the eCovers you can create with this software. Includes 15 pre-made templates. 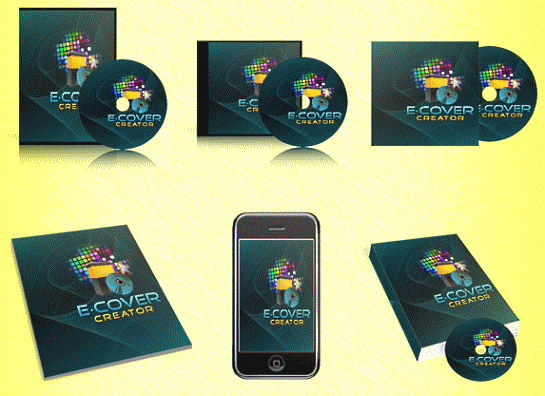 100% configurable styles make each ecover unique or create a series of similar graphics. Quickly and easily create 15 different eCover styles on the fly. Not have to worry about installing complex or expensive action scripts. Import .psd, jpg, gif, bmp or .png images directly into the software. Create amazing looking eCovers with just a few mouse clicks. Save valuable time and money trying to learn other action scripts. 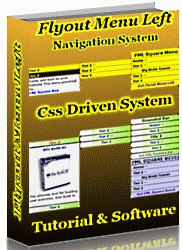 This software makes creating 3D ebooks, software boxes, DVD's, & CD's amazingly simple and the best part is it's compatible with any graphics editor! 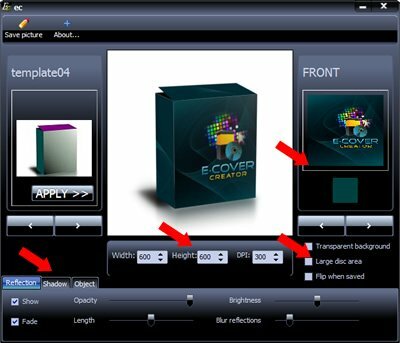 So whether you've just started designing or you're an experienced graphic artist, this software application will make it "point and click easy" simple to create incredible 3d ecovers! With just a few simple clicks of your mouse you can quickly and easily create ecovers that look amazing! Select the eCover you want to use for your product and click "Apply".Use the arrow keys to move between covers. You can change from one to another to create several ecovers in one session. Select from the color palette or import your own images for your cover and then choose some preferences that suit your taste. Either use a blank color background for the side, top and front or upload an image you create. Use the arrow keys to move between panels. Size matters Use the 'width' height' and 'DPI' settings to generate large, medium or small ecovers. Select whether you want a transparent background or colored background. Use the "Flip when saved' option to create left or right versions. Now just click on the "Save picture" icon to save your image to the desired file type. Save as a .bmp .jpg or .png. Just 3 steps and you are done. 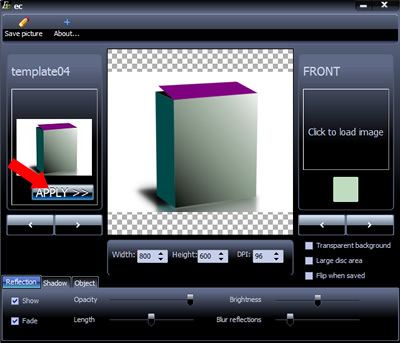 With this software you no longer have to worry if it's compatible with your graphics editor. Since this is a software and not an action script, you don't have to have Photoshop to make it work. Easily find the 3D cover for your product or service. Adjust the width and height for your eCover. Adjust the shadow, reflection and highlights for your cover. Import custom graphics or choose from the color palette. 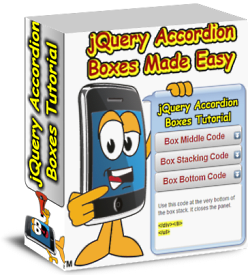 Create a transparent background and flip the box horizontally. 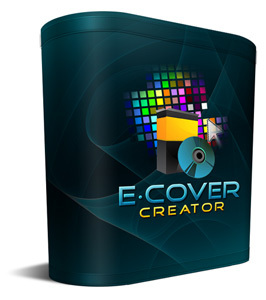 Easily export and save your eCover project to it's own folder. It's simple really...this ecover software will save you time and make creating ecovers for your products quick and easy. 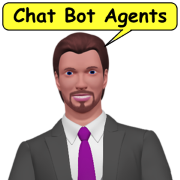 I cant believe how easy this software is to use. 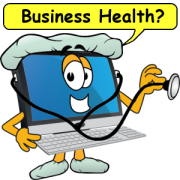 I made 2 ecovers for my weight loss ebooks and now sales are booming. 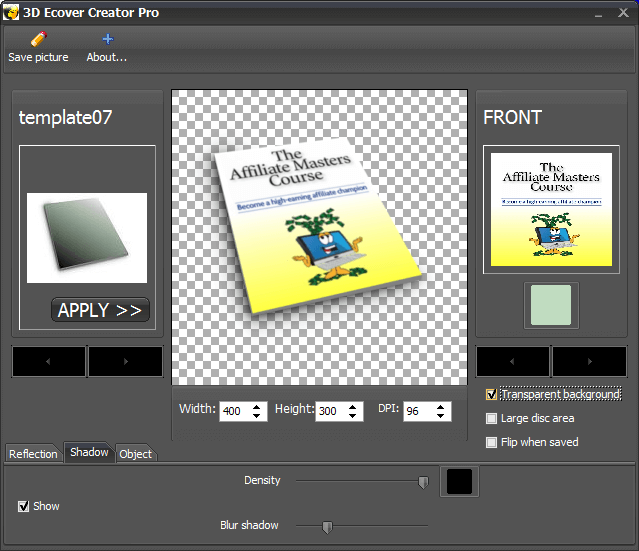 Before 3d eCover Creator Pro I had maybe 1 sale a month. Thanks Tim my 3d box looks great. It really helps promoting this product. People can see at a glance what the software does. It only took 5 minutes to build several ecovers. I made 3d boxes, book covers and pamphlets with ease. Why not start today off by making your life easier and go download 3d eCover Creator Pro software right now! P.S. 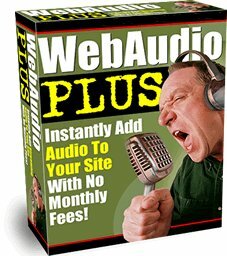 Training video included with download. You can relax knowing that your download is protected by our 30 day money back guarantee. If you're not satisfied, just let us know and we'll refund your download, no questions asked.